Let’s now try to answer these questions, and try to suggest the right choice in different situations. The size of your business should be reflected onto your eCommerce store. If your business is small, and you only want to cover a narrow niche of the market, with very targeted, small number of possible customers, some of the hosted eCommerce platforms will do just fine for your online store. Also, if you had just started your business, and you don’t have a physical store, and your only point of sales is going to be the online store, the choice could be the same. On the contrary, for well established businesses and brands, there could be lot of limitations with hosted solutions, and the possibilities of customization of the online selling platform to the specific needs of the company will lead to choosing a custom solution. Focusing on the core business, and letting the professionals do the design and programming is the reasonable way of thinking for large businesses. Budget is one of the strongest limitations that, in many cases, can’t be easily overcome. The psychology plays an important role in this process. Creators of hosted eCommerce platforms have realized that, and they have created monthly and annual plans with ridiculously low prices. But, are these prices really low, you can experience only if you subscribe, and see what you get for your money. If you have a very low budget, you can’t even think about a custom solution for your web store, as prices may be really high. So, you will have to try a hosted one. On the other hand, if your business can assign enough money to the project to make a great online store, you will search for a partner among software companies which develop and implement custom solutions. Some custom solutions offer great features, and very advanced analytics, with unlimited customization possibilities, and optimization for mobile devices, and still have reasonable pricing. They are worth considering because they may cost less than starting with a hosted solution, and after a while realizing that it was a serious mistake. These companies offer free assessment of your project, and even free demos, so you can try the platform, and ask a professional for additional information to help you understand all features, and possible customizations of the platform. This could be the one of stumbling stones in the decision process. Why? The number of different products, or different types of products, may be an important factor to determine the capabilities of your online selling platform. Some platforms have advanced options, and features for certain types of products, more than others. And in most cases, you will want to implement some features that are important to you and your target market. Hosted eCommerce platforms can be optimized for selling clothes and shoes, or computers and mobile devices. Other can be very well equipped with advanced functionalities for promoting and selling cars, and other types of vehicles. Also, there are platforms optimized for selling food products. Some of them have very advanced marketing features, and even great analytics module, for decision support. But, to gather all this in one hosted solution is impossible, and you will have to do a lot of analysis to be sure that the solution you have chosen really supports the features needed in your case. If you only have one type of products, or at maximum two types, chances are that you will be able to find a suitable hosted solution. With an advanced custom solution, your online store can look precisely like you have imagined it, and offer both you and your customers all needed features tailor-made to your business and your type/types of products. So, if you have a dozen of different types of products, you can make a dozen of different custom features to support them, and provide your customers with a unique buying experience. This might seem easy. Many people working for the online store means creating many accounts, they can log in and work, and everything is fine. Wrong. Very wrong. Many people means many different roles: sales people, marketing staff, logistics and shipping, managers. They all have different needs, and use the platform in different ways. Sales people simply follow the orders, check the billing status of each order, and make sure that prices are correct and updated. Marketing managers create new products, promote them to the targeted audience, analyze sales, and forecast the future demand. People in the logistics and shipping sector make sure that products are available for shipping, they take care that all shipments are done on time, and with minimized expenses for both the company and buyers. Managers require Business Intelligence, and smart Predictive Analytics module with advanced Dashboard, to be able to analyze all KPI’s and make high quality decisions for the future wellbeing of the online store, and the business in full. These employees often use ERP and CRM software systems which needs to be connected, and work together with your online store. Again, to avoid additional expenses for implementing this connection in a hosted platform, and relieve yourself from lot of stress, it is good to know that all companies which offer custom software solutions understand that this should be an integral part of their offer. And it is. If you don’t have such complex business structure, a hosted eCommerce solution may be able to satisfy your online selling needs. Otherwise, don’t even think about it, as at some point (sooner or later) any or all of your staff will require a feature that these solutions can’t offer without a professional design and programming support. Migrating your store to a custom solution might be painful and costly much more than if you had chosen the custom solution at the very start. The complexity of the store is one of the easiest factors to consider. Simply, if you sell small number of products of the same type, you don’t need advanced features, analytics and reporting, and you don’t plan to develop your store to a more complex one for a long time, investing in a custom solution would simply be wasting money and time. In any other case, custom solution is the only good choice. Because of lower expenses of hosted eCommerce solutions, people often think it might be smart to invest in a hosted plan, start selling, and at some point, when the store starts bringing in some serious money, turn to a professional software company to start customizing the store to the evolving needs of the business. 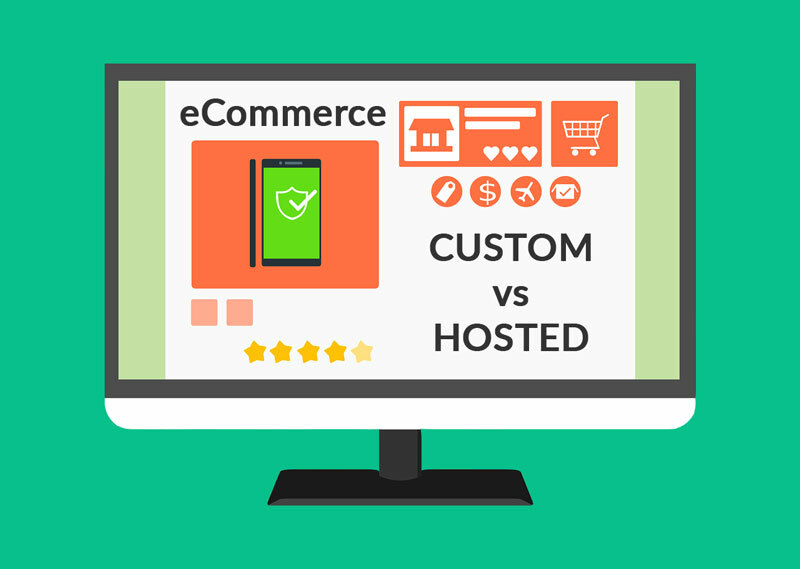 This has shown to be a faulty approach in most cases, as making an advanced custom online store out of a hosted one proved to be painful and costly, and sometimes even impossible without creating a completely new, custom store. Be wise, and think upfront. Gather valuable advice from other people with more experience in online selling. Take into consideration all the important factors. Only then make the decision, and choice. Do you implement an omnichannel approach with different locations and complex inventory management? Omnichannel approach is very popular these days. In my modest opinion, it is the best approach for any successful business, and for all businesses striving for success. It means combining all possible marketing and sales channels in order to sell products or services to your target customers. Online store is only one channel, and there also may be physical stores and warehouses in different places. Also, products and services can be offered to businesses (B2B) or individual customers (B2C). Omnichannel approach is difficult to achieve through a hosted online selling plan. In some cases, businesses may start with a hosted plan, and soon they will have to ask for help in creating advanced features to support their omnichannel approach in selling, promoting, inventory management, logistics and shipping, payment options, analytics etc. Again, please note that transition from a hosted to a custom eCommerce solution is not an easy and inexpensive step. This is a very serious subject to discuss. Knowledge can save time and money in many ways. It is dangerous to enter online selling process without any knowledge about how it all works. You should at least understand the basics, in order to be able to make the right decisions. I suggest learning as much as you can. You don’t need to be a web designer or programmer, but you should be able to understand the process of building an online store, maintaining it, and getting the most out of it to maximize your revenue and profit. You may start with reading sales and marketing blogs, and then maybe even move to more serious learning about web design and development at w3schools, or Lynda.com. If you are not able to do the job yourself, you already have enough information to make a good decision, according to the answers you have given to the questions I have asked above. So, good luck! Whatever your choice, don’t wait too much, because your competition is already online, and selling. And the ones who are still not equipped with an advanced online store, are probably thinking of getting one for their business, just as you are.